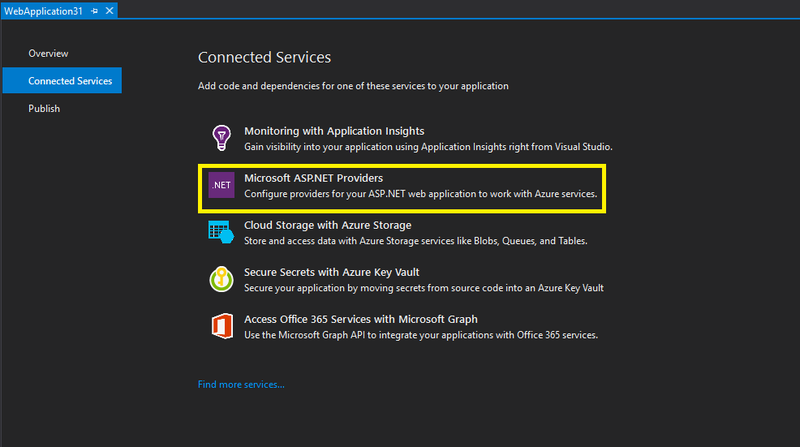 Configure providers for your ASP.NET web application to work with Azure services. Provider pattern was introduced in ASP.NET 2.0 and it gives the developers the flexibility of where to store the state of ASP.NET features (e.g. Session State, Membership, Output Cache etc.). 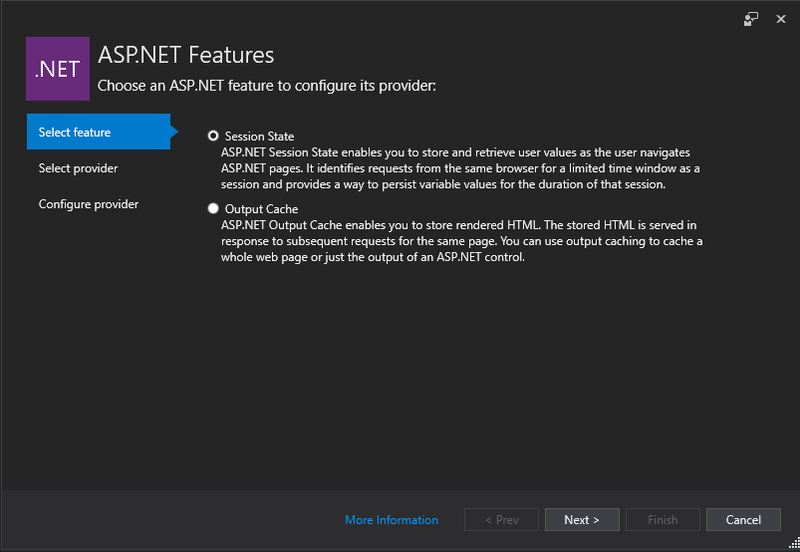 In ASP.NET 4.6.2, we added async support for Session State Provider and Output Cache Provider. These providers provide much better scalability, and enables the web application to adapt to the cloud environment. Furthermore, , we also released SqlSessionStateProviderAsync, CosmosDBSessionStateProviderAsync, RedisSessionStateProvider and SQLAsyncOutputCacheProvider. Through these providers the web applications can store the Session State in Azure resources like, Azure SQL Database, Azure Cosmos DB, and Azure Redis Cache, and Output Cache in Azure SQL Database. With these options, it may be not very straightforward to pick one and configure it right in the application. ASP.NET Providers Connected Service Visual Studio Extension will help you pick the right provider and configure it properly to work with Azure resources. This extension will be your one-stop shop where you can install and configure all the ASP.NET providers that are Azure ready. To use the Extension, you need to make sure that your web application targets to .NET Framework 4.6.2 or higher. You can open the extension through right clicking on the project, selecting Add and clicking on Connected Service. You will see all the Connected Services installed on your VS which apply to your project. After clicking on Microsoft ASP.NET Providers extension. You will see the following wizard window, you can choose the provider you want to install and configure for your ASP.NET web application. Currently we have two sets of providers, Session State providers and Output Cache provider. Select a provider and click on the Next button. You will see a list of providers that apply to your application, which connects with Azure resources. Currently we have SQL SessionState provider, CosmosDB SessionState provider, RedisCache Sessionstate provider and SQL OutputCache provider. After the provider is chosen, the wizard window will lead you to select an Azure instance which will be used by the provider selected. In order to fetch the Azure instances that apply to the selected provider, you will need to sign in with your account in Visual Studio. Then Select an Azure instance and click on the Finish button, the extension will install the relevant Nuget packages and update the web.config file to connect the provider with that selected Azure instance. If the application is already configured with a provider and you want to install a same type of provider, you need to remove that provider first. E.g. your application is using SQL SessionState provider and you want to switch to CosmosDB SessionState provider. 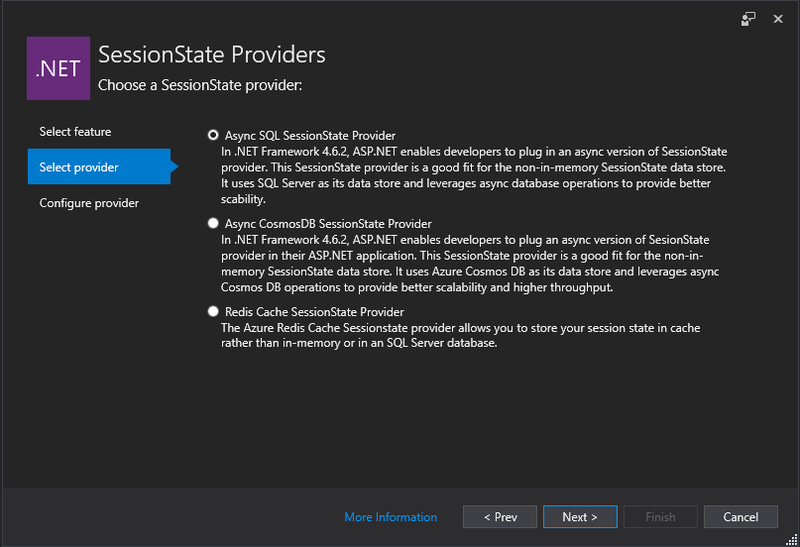 In this case, you need to remove the SessionState Provider settings in the web.config, then you can use ASP.NET Providers Connected Services to install and configure the CosmosDB SessionState provider. 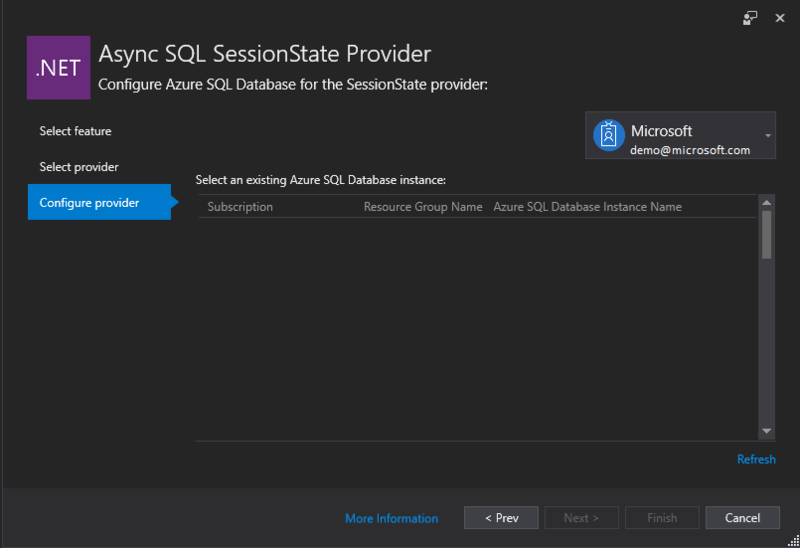 If you are installing Async SQL SessionState provider or Async SQL OutputCache provider, you need to replace the user name and password in the connection string in web.config added by ASP.NET Providers Connected Services. As you may have multiple accounts in your Azure SQL Database instance. ##Next steps Please start to use this extension today and leave us your feedback here.